On September 25, National Public Radio aired a report on Morning Edition about kapparot, in Brooklyn, New York, that included a link to our Website on theirs. Though UPC president Karen Davis’ interview didn’t make it into the final story, UPC provided the perspective of animal rights opposition to “swinging” and slaughtering chickens in kapparot ceremonies and put the reporter in touch with Brooklyn activists, Sam Schloss and David Rosenfeld, whose powerful voices dominate the NPR report. The “pamphlets” handed out by David and Sam in the report are UPC’s brochures A Wing & A Prayer: The Kapparot Chicken-Swinging Ritual. 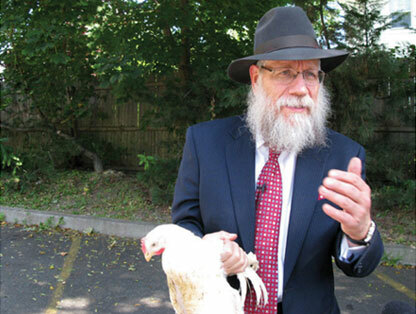 This year, as in previous years, David Rosenfeld rescued two chickens from a kapparot vendor. They are now living peacefully at Farm Sanctuary, in Watkins Glen, NY. To read the NPR transcript and listen to the report, go to our Website and click on the “Ethical Kapparot” document at www.upc-online.org/kaparos/090929jewish_journal.html. Our entire kapparot campaign, including the NPR report, is posted at www.upc-online.org/kaparos under Chickens.